Alex Lloyd Gross Photo- Delaware Valley News.com State Senator Art Haywood speaks during the rally. His office helped this franchise open and now they hang up the phone on him when he calls about getting them to pay employees more than the minimum wage. 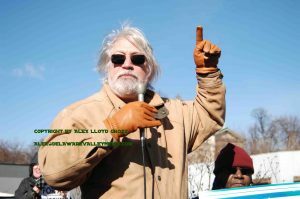 Alex Lloyd Gross- Photo- Delaware Valley News.com John Meyerson talks about why it’s important to raise the state wage. Image going to work knowing that co workers doing the exact same job as you are getting paid substantially more money. The person responsible for your law pay is a rich politician who thinks you are doing fine. You would be livid. 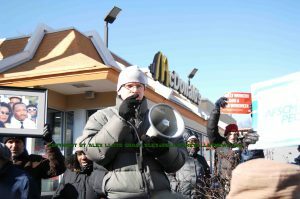 About 150 livid workers converged on the McDonalds on Chelten Avenue in Germantown to target the restaurant for paying poverty wages, and also to bring attention to the plight of underpaid workers. It was 11 degrees out and the protesters came out strong. The protesters were not alone. They were joined by politicians like State Senator Art Haywood, who said “When this franchise needed help coming into the community, we helped them. When we called to ask about pay increases, the general manager hung up the phone on us,” Inside, workers stated they start at $7.25 per hour and get just shy of $9.00 per hour after a few months of working. “Those wages are a disgrace, they are poverty wages,” said John Meyerson, an activist who runs the Raise the Wage PA. website and social media accounts. The day was a national day of service , which many people pay tribute to Reverend Martin Luther King. So the politicians came out, and blasted the culture of owners making millions off workers and paying them poverty wages. There is a nationwide push for states to raise the minimum wage to $15.00 per hour. “We have the votes. but the republican leadership won’t put this to a vote. 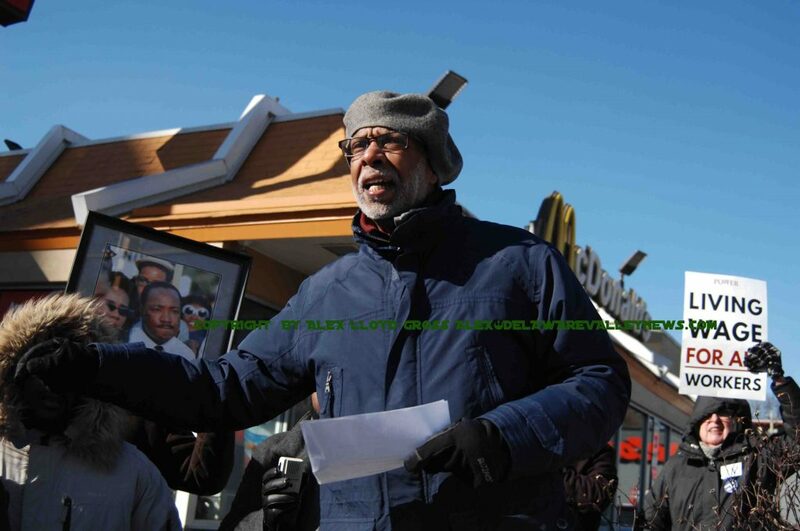 If they do, they know it will pass, and they don’t want that,” said Haywood. Alex Lloyd Gross Photo- Delaware Valley News.com Rev. Kent Matthias speaks during the rally. He stated that 26 percent of the workforce works in poverty. One such politician is Joseph Scarnati 111. His constituents live in Jefferson County. According to Hardy, they will benefit as well. The area of the McDonalds is littered with abandoned shops and vacant buildings. According to Meyerson, “This area used to be busy. It died , not because wages were too high, but because they are too low. Higher wages means more money is spent in the community.,” Senator Haywood doubled down on that point, “When we pay more, state state saves on benefits like food stamps and insurance, so it’s also [putting millions back into the state coffers,”. Opponents of raising the minimum wage point to the fact that 16 year olds do not need to be making that much money, raising the wage means prices go up and stores close. These points have been shot down. The people working at McDonalds for $7.25 per hour were all adults. Prices in that store have risen multiple times since the minimum wage last went up in 2009. In Seattle Washington, where the wage is $15.00 it has now gone to $16.00.